Dr. Shaun Murphy, a native of Richardson, TX, attended Jesuit High School and was the salutatorian of his graduating class. His medical training began at the University of Texas Health Science Center in San Antonio, and it ultimately found him completing his residency at Baylor University Medical Center in Dallas. Dr. Murphy and his medical staff are very passionate about providing personalized medical care to each of his patients. During his free time, Dr. Murphy is an avid golfer and fisherman. He is also an aquarium enthusiast. Dr. Murphy started his own practice in 1999. In 2004 he became a part of Dallas Medical Specialists where he was Chairman of the Board and Medical Director. In 2011, HCA Physician Services North Texas Division was honored Dr. Murphy as the Chief Medical Officer. Later in 2012, Dr. Murphy began working with the Senior Center of Dallas Medical Specialists. 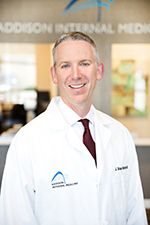 Dr. Murphy provides comprehensive internal medicine services at the Addison Internal Medicine clinic. He focused on improving the total wellness of his patients through accurate diagnostics, coordinated disease management, and preventative medicine. Dr. Murphy is accepting new patients. To schedule an appointment with J. Shaun Murphy, MD, contact Addison Internal Medicine online or give our office a call.